Cherry Mobile Flare XL Plus Leaks! Comes With 5.5 Inch Screen, Octa Core Chip And 2 GB RAM Under 4K Pesos! Home / cherry mobile / leaks / mobile / Cherry Mobile Flare XL Plus Leaks! Comes With 5.5 Inch Screen, Octa Core Chip And 2 GB RAM Under 4K Pesos! Cherry Mobile's annual fiesta sale is fast approaching, and as we all know there will be a lot of discounted and new devices that will be announced there. Recently, there are leaks of their new brochures that circled around the net. One of them is the Cherry Mobile Flare XL Plus, a bigger Flare S4 looking handset with great specs in the sub 4K range. 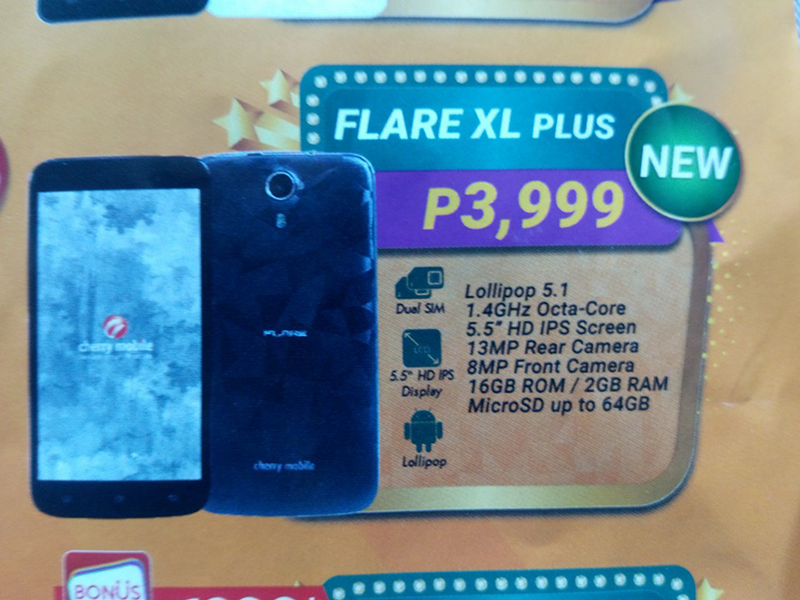 Related: Cherry Mobile Flare XL Plus Goes Official, Octa Core With Deluxe Style For 3999 Pesos! The Flare XL Plus features a 5.5 inch HD IPS screen with a resolution of 1280 x 720 pixels at 267 ppi, runs on an unknown octa core chip clocked at 1.4 GHz, has an ample 2 GB of RAM, 16 GB of expandable storage, 13 MP rear camera, 8 MP selfie camera and dual SIM connectivity. What's missing in the details is the exact battery capacity and what type of connectivity it has. We also suspect that this one is using the MT6592m by MediaTek paired with Mali 450 GPU. If we believe on what the brochure says, it retails at 3,999 Pesos only making it one of the better phones in the sub 4K range. Related: The 6 Inch Cherry Mobile Flare XL 2 Leaks Too! Runs With 1.3 GHz Octa Core Chip And Marshmallow OS For 5999 Pesos! Click Here!